Kanye‘s ex-flame claims that he doesn’t write his music. Amber Rose recently got on stage at Los Angeles’ Supper Club to complain about a DJ playing Kanye West. She grabbed the mic from the host, asked him to “stop playing n****s I used to f***”, and claimed that the he should be playing Travis Scott instead, as Scott, apparently, writes his songs. 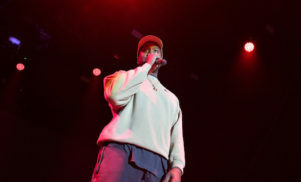 We’d take her claims with a big pinch of salt: it’s well-known that the sessions for Yeezus were group affairs, with various other artists contributing to lyrics (The Weeknd, for instance, was involved but didn’t have an official feature on the final album, and King Louie has claimed that he contributed to several songs on the record). Shame she didn’t ask for Novelist, really.